The most obvious change is the addition of a City-owned, public park in the middle of the development, along McRae Ave. The decision to add this park was done in response to resident concerns about lack of supportive infrastructure for increased density such as parks and green space. Adding the park resulted in a few other design changes. 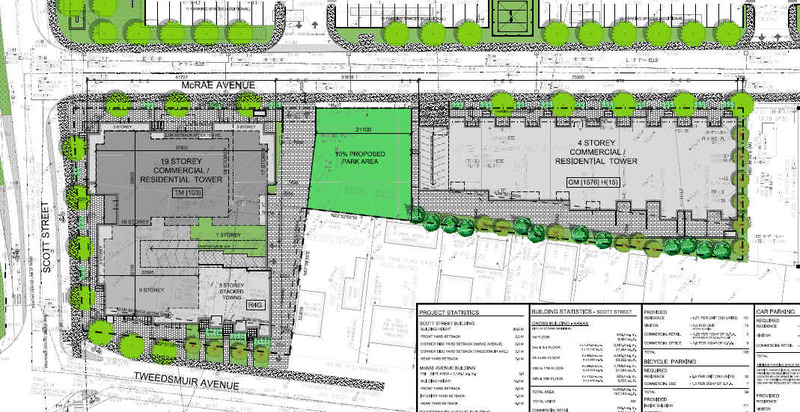 You can see on the plans that the two proposed 4-storey buildings along McRae have now been merged together and moved south slightly. Also, there are now two vehicle entrances and exits, both along McRae Ave, one on each side of the proposed park. Each entrance and exit on either side will serve an underground parking garage: one for the McRae building, and one for the Scott St & Tweedsmuir buildings. In the first design, there was one vehicle entrance off McRae Ave, that lead into an underground parking complex that served the entire development. Now, one entrance/exit will serve the 4-storey McRae building, and the other will serve the 19-storey & 9-storey buildings along Scott St. Adding the City-owned park meant that the developer can’t build underneath it to connect the parking structure. By adding the parking entrance and exit to service the 19-storey & 9-storey building separately, also means that the 3-storey setback on the 19-storey building has been reduced. There is also no longer a purely pedestrian connection between McRae Ave & Tweedsmuir Ave. I remain opposed to this development as not respecting the intent of the secondary plan with respect to an appropriate transition from low-rise to high. After viewing the updated plans, make sure to send any comments to the lead Planner Erin O’Connell by e-mailing her at erin.o’connell@ottawa.ca, and feel free to include our office so we can hear your feedback as well.